Beyond just giving a good visualization of how large the tree of a given wood species grows, (in height and diameter), these measurements can also help to give an idea of what size boards/lumber is available. For instance, Swietenia macrophylla (Mahogany) trees grow very large, and it wouldn’t be surprising to see very wide (16″ or more) boards for sale. Yet it would be nearly impossible to find a board that large from a much smaller tree, such as Dalbergia cearensis (Kingwood). 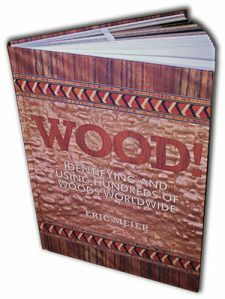 If you’re interested in getting all that makes The Wood Database unique distilled into a single, real-world resource, there’s the book that’s based on the website—the Amazon.com best-seller, WOOD! Identifying and Using Hundreds of Woods Worldwide. It contains many of the most popular articles found on this website, as well as hundreds of wood profiles—laid out with the same clarity and convenience of the website—packaged in a shop-friendly hardcover book.